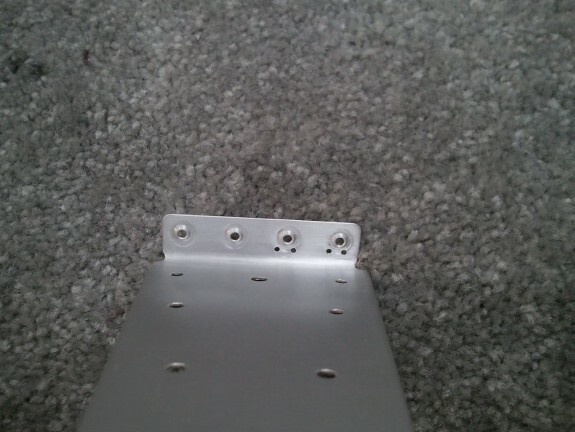 I decided to install the servo Z brackets with NAS1097 rivets in the last 2 aft holes. This allowed me to countersink the holes rather than dimple and still get good clearance of the servo when installed. It is tight, but clears. 0.032″ skins are just enough for AD3’s. I was careful to not over countersink but it was close. As mentioned in the prior log entry, the location of the servo per the plans is not right. As you can see here, I located it where it does belong and the jack shaft of the servo lines right up where it belongs. 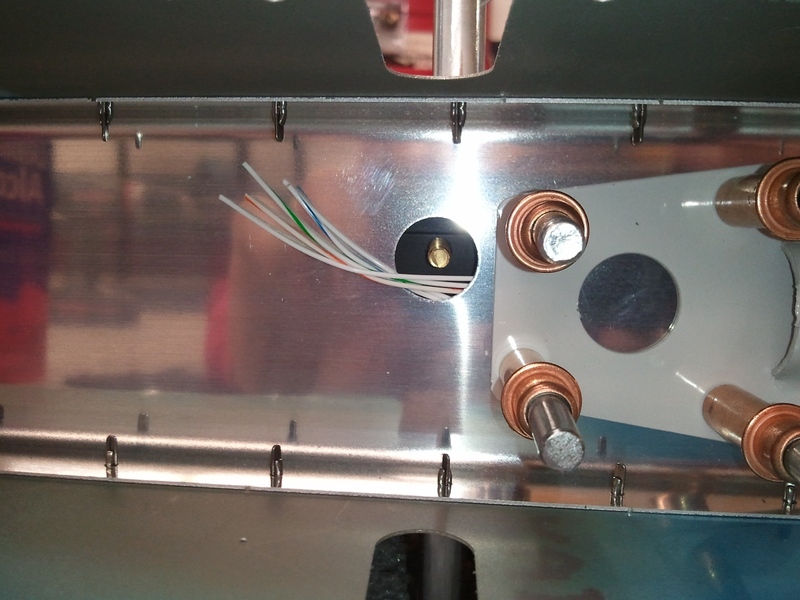 I do not like that they want you to have the wires exit in the same hole so I may open up a 3/8″ hole just above (below in this picture) the jack shaft hole, to route the wires for the servo through to avoid any interference. Trim cover plate installed. You can see the arm of the servo is right in the middle of the slot and ready for the tab. Looks good to me. 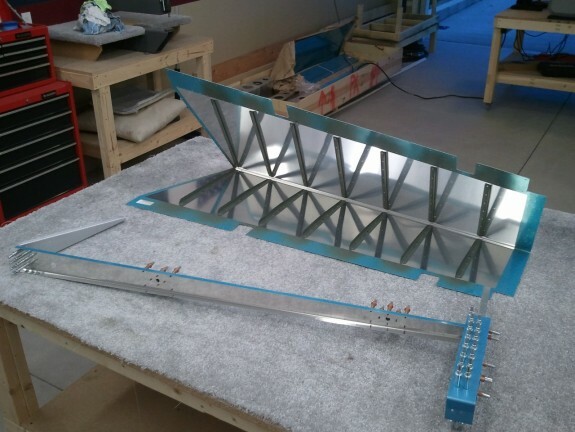 Now I have to take it out and start match drilling the skins to the skeleton and prep for the trim tab assembly. The other item I need to think about is how to hookup and where to route the trim servo wiring. I have a few ideas…we’ll see how it ends up down the road. In the spirit of doing something little any chance you can, I decided to work a little on the elevator trim servo/mount/cover tonight. I am using the electric trim option as I love it in the CAP planes I fly. Not to mention, I will more than likely add the auto trim feature in conjunction with the auto pilot I want to install too so electric trim is required. 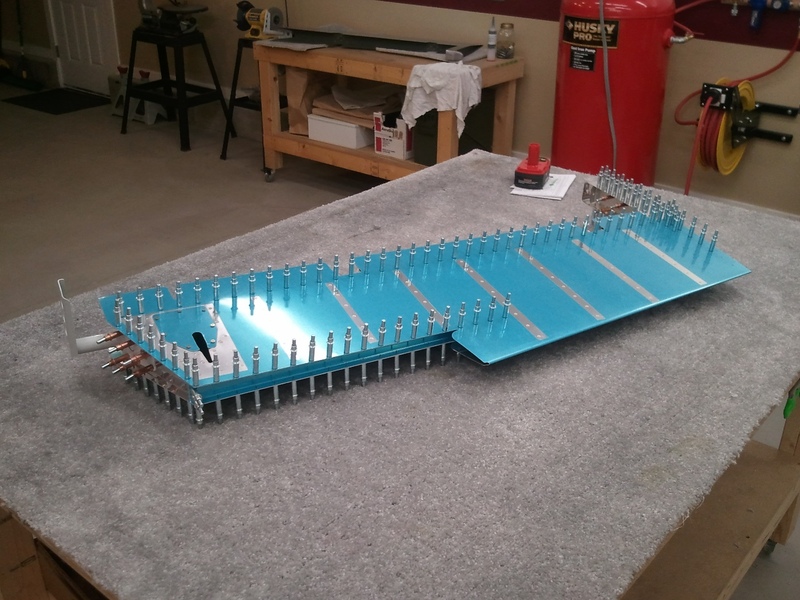 It may be overkill, but heck…I am building MY plane. So I studied the plans that outlined how and what I needed to do to mount the trim servo. 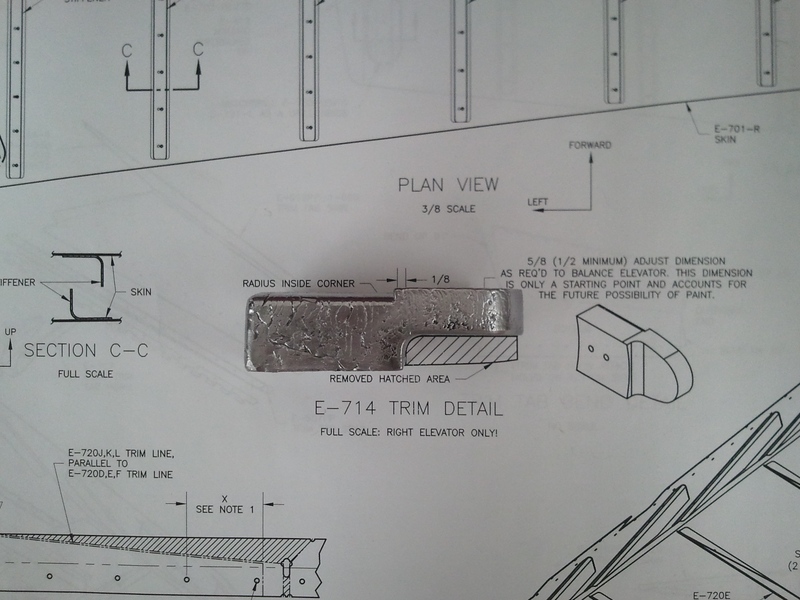 I made certain that I remembered that I was looking at the outside of the cover/inspection plate in the plans. 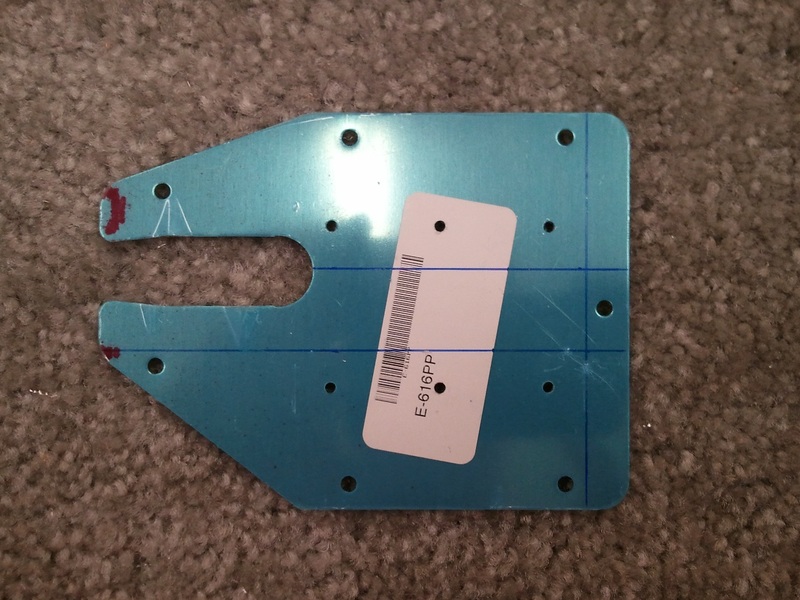 I did not want to accidentally measure where to mount things by reading the dimensions relative to the outside and mark them on the inside wrong. 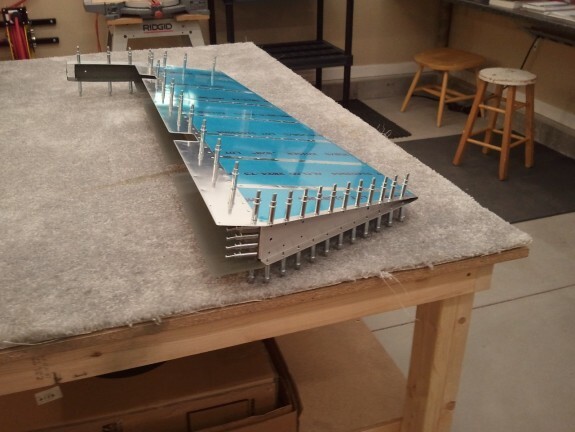 As you can see from the plans, you are to measure from the outboard side of the cover 1 3/8″ in and 3/8″ in from the forward edge. 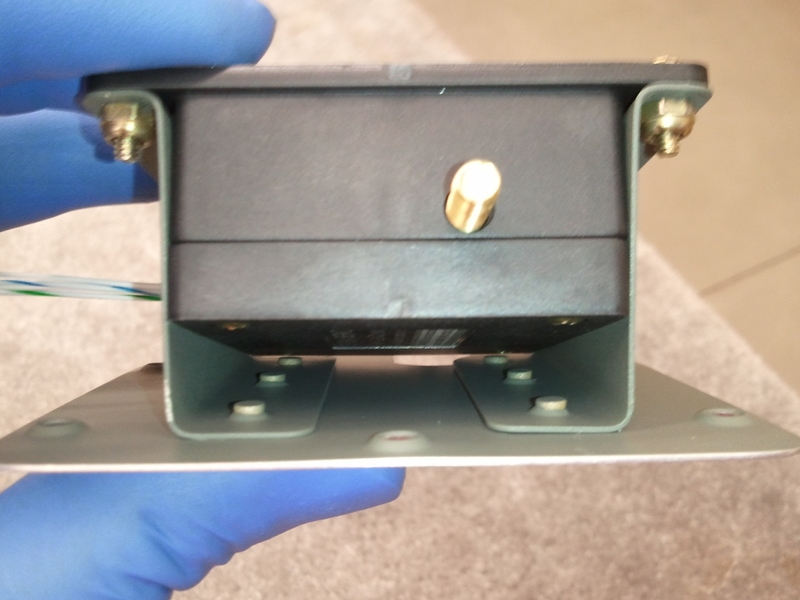 This is then where you put the inboard forward edge of the left servo bracket (EET-602B-L). I grabbed my ruler and then began to mark the cover with the measurements outlined. You can see here that the “upper” line is the line represented in the plans that should be 1 3/8″ from the edge. Basically, set the plate face down on the plans and then flip it up so it is a mirror image. Right off the bat it was clear that this was not right. 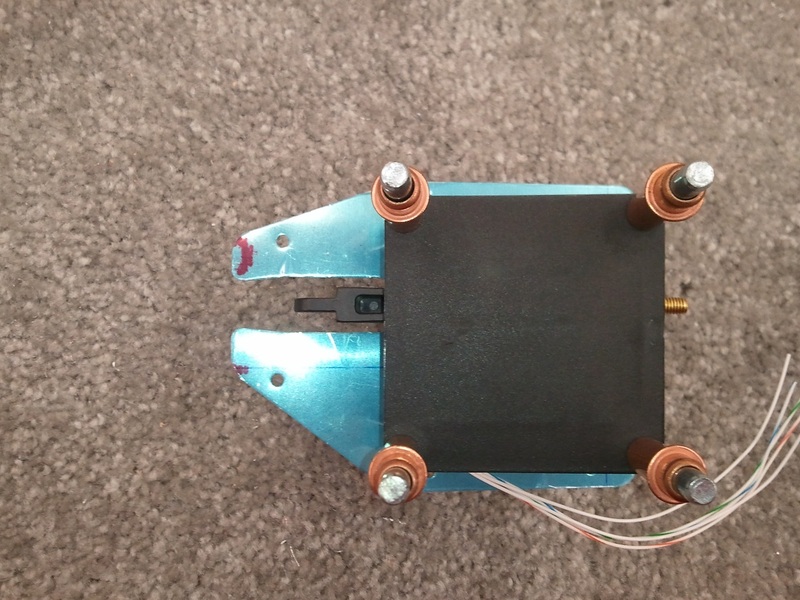 The line seems to be nearly centered in the slot for the servo arm. Referencing the plans again showed it really should be offset a bit. Clecoing the servo to both mounting brackets and setting it on the cover confirmed this as well, the output arm of the servo was not centered in the slot as the plans show. I scratched my head a bit and thought…what if they really meant 1 3/8″ from the other edge and just marked it wrong on the plans? With all the flipping and translation to the part you have to do with the drawing, maybe they made a mistake…though unlikely. I also did a search on vansairforce.net to see if others were having issues with this drawing as well. The search returned a few replies that led me to believe the unlikely was true. What the heck, I have not drilled anything yet, so I drew another line from the other edge and lined up the inside edge of the EET-602B-R and interestingly enough, the servo output was dang close to center in the slot. I think the draftsman did actually reverse the part. With the bracket confusion now settled and the correct orientation determined, I clamped the EET-602B-R to E-616PP. Having learned to not back a hole you are drilling with your finger, I used block of wood behind the hole I was drilling and match drilled the bracket to the cover, clecoing as I went. Once that was done, I clecoed the servo and other bracket back on and then clamped the EET-602B-L on and repeated the process. Once complete and both are clecoed on, you can see that the EET-602B-L reference line as outlined in the drawing is indeed off by about 1/16 of an inch. It may not seem like a lot, but it will make a big difference if you were to follow the plans. I have read that some have just followed the plans and had to widen the slot for the arm, and others just replace the cover and do it again by eye. I recommend however you simply measure from the other side and line up the opposite mount bracket and you should be OK.
All said and done, the servo output shaft is right where it should be. 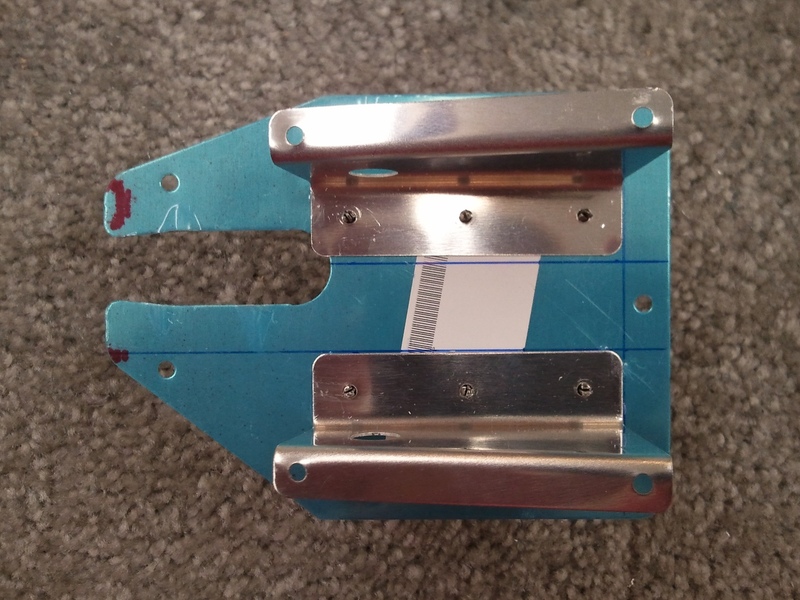 The last problem is that the aft two rivets that rivet the servo mount brackets to the cover may actually cause the servo to sit proud of the mounts because the shop head/dimples may contact the case. I may countersink the last two to avoid this. I have heard that some have made shims for the servo while others smash the heads a little more to clear the servo. Neither seems correct to me as one moves the servo alignment and the other weakens the assembly, granted, not by much. Stay tuned for the solution. With the right elevator now closed up, the manual has you move on to the left (or harder) elevator. 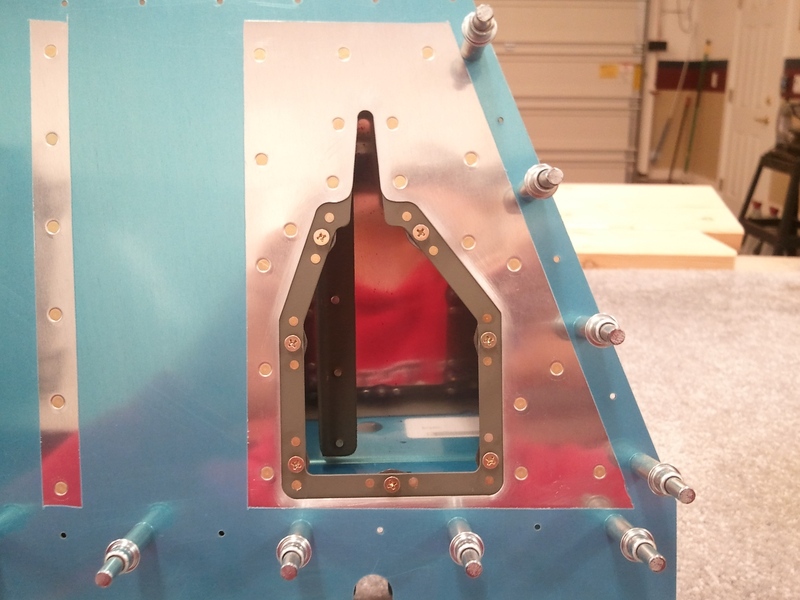 They note that it is a little harder because of the complexity of the added trim tab that is part of this assembly. I still had some time after finishing up the right closure so I grabbed the parts for the left and began to assemble. I began with the spar, added the reinforcement plates and plate nuts. Worked on the outboard ribs and counterbalance drilling. Added the spar for the trim tab, the root rib, and the skin. It is amazing how quick it goes when you have done it before. After about an hour, the left elevator parts were all clecoed and ready to match drill. I decided to call it a day. I will hopefully match drill this some time next week. I cannot believe I am almost done with the empennage major work. 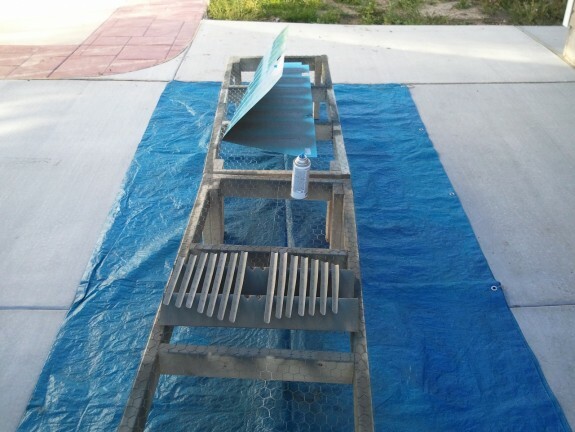 However, what is left is some of the harder parts to do right…so I am going to pace myself. The replacement E-709 rib arrived on the 27th and as soon as I got home, I went right to getting it prepped. I first reamed out the four holes on the forward flange and then dimpled the holes with my pop rivet dies to be safe. I then clecoed it into the elevator assembly as I had left it on Saturday. I was able to match drill it to the skin and to the horn. I then removed it, dressed the edges, dimpled it and then shot it with primer. Took about an hour to complete all the steps. I then dimpled the rest of the skin where the E-709 goes. I then disassembled the parts again and set them aside and ready for the next build session. Friday was a busy night with Halloween parties so I was unable to get the skeleton finished. No worries, it was all ready for assembly for my build session today. As soon as the sun was up and breakfast was done, I ran out to the shop. I joined the new E-709 to the E-702 spar and then riveted on the the WD-605-R-1. The skeleton was complete now. I then added RTV blobs to the ends between the trailing edge portion of the interior stiffeners. The idea is that it ties them together and dampens vibrations. Apparently some builders have reported cracks in this area after the plane has flown for some time. Hopefully this helps counter/eliminate this problem. I inserted the E-714 counterweight previously milled down in the nose of the E-713 skin and then inserted the skeleton. I then clecoed it all back together for the final time. Now it was time for fun. 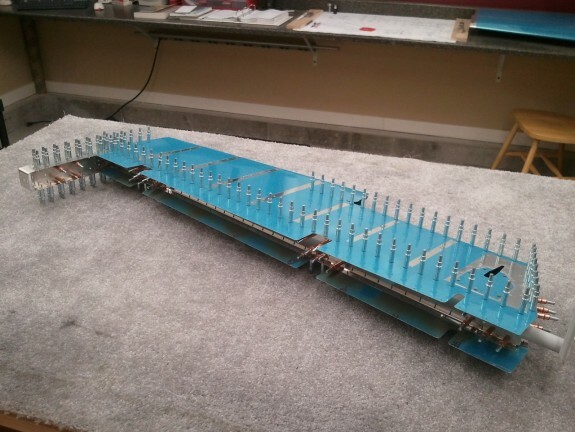 I final riveted the E-703 and E-704 ribs to the E-713 skin on both top and bottom. I then continued along the E-703 rib to the second to the last hole with my pneumatic squeezer. 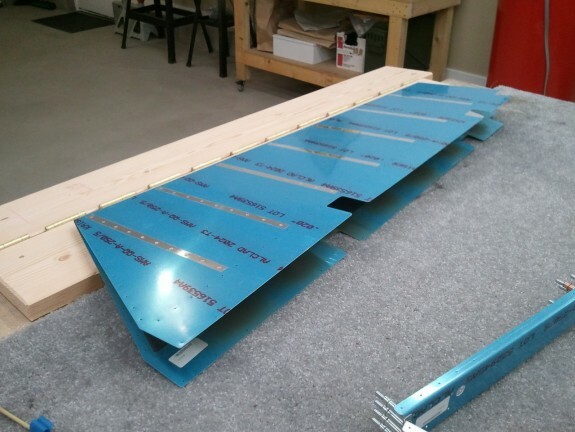 The last holes near the trailing edge are just too tight. I then did the same along the root E-709 rib. Then I did the spar. With the squeezer, you can move along pretty good. The final riveting took no more than 30-40 minutes to complete. As for the last trailing edge holes on the outboard and root ribs, I simply used some MK-319-BS blind rivets and called it good. Better to fill the heads with body filler than have to repair an entire panel with the stuff. I Did it Again! Grrr…. 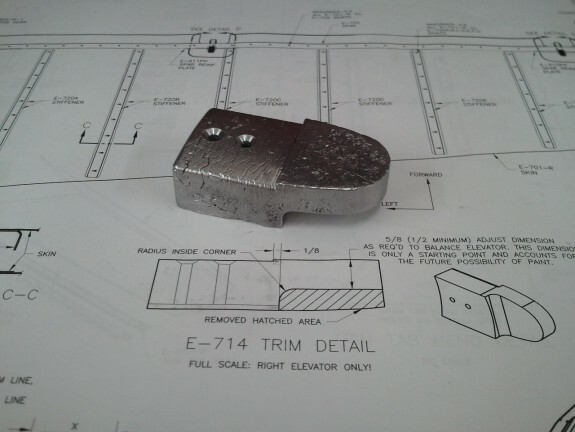 The instructions say in order to join the right elevator Spar (E-702) to the root rib (E-709) you have to use flush (AN426) rivets so that the elevator horn (WD-605-R-1) can lay flat against the spar at the joint. 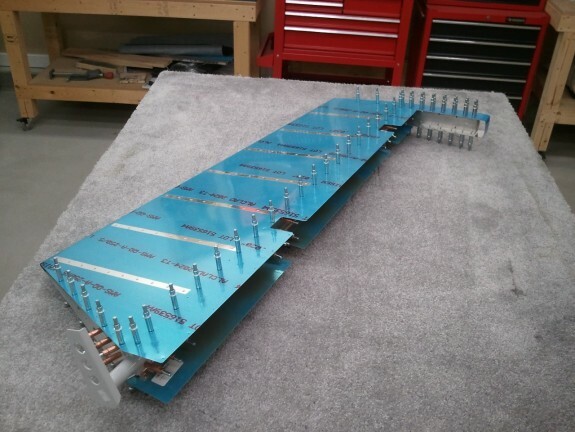 To do this, they say that you need to countersink the forward face of the E-702 spar for the flush heads for the four holes that join it to the E-709 rib. 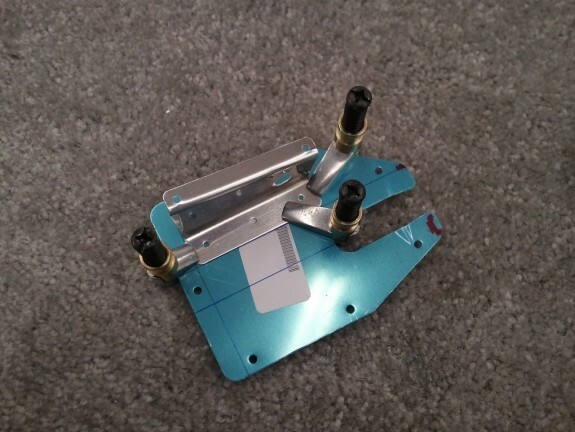 Another option that Van’s says is OK is to dimple the E-702 spar and the E-709 flange instead. 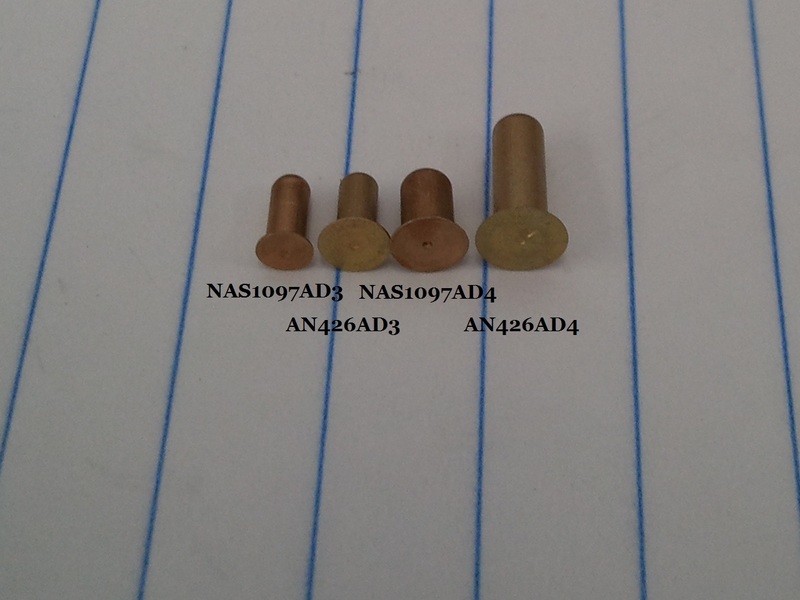 Really, these 4 rivets are simply nailing the flange of the E-709 rib to the E-702 spar but most of the strength is handled in the Elevator Horn that also rivets these two parts together at the corner. With that said, I chose to dimple these over the countersink. 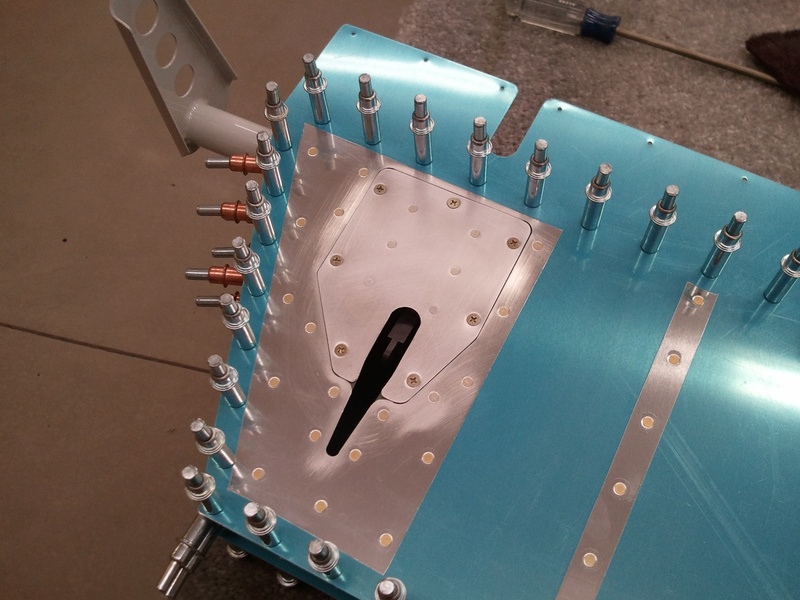 After all, the dimple keeps the full thickness of the parts and should be stronger. Dimpling the spar was a matter of putting the dies in the DRDT-2 and smashing away. The rib flange is another story. 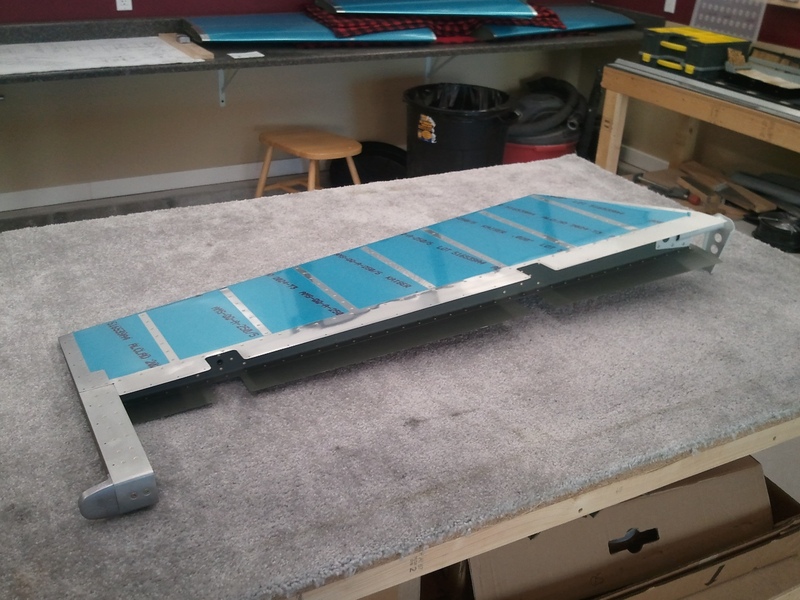 It is bent past 90° and thus makes it tough to get the dies on the back side much like the trailing edges of the skins for say the elevators and ribs. Typically, I would grab my pop rivet dies here and squeeze away. However, I had just purchased a tool that I thought…heck, that should work here. Here is the tool. 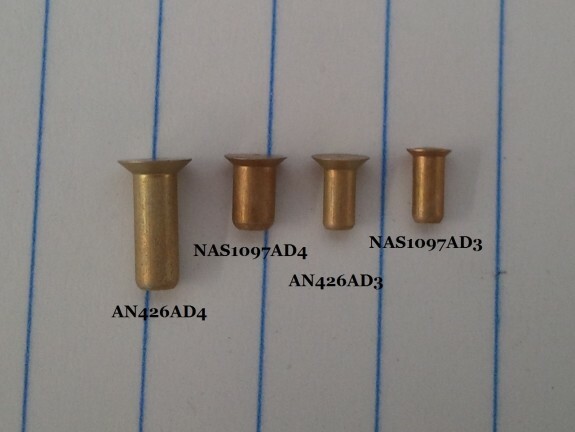 Basically, it is a female die for a AN426AD3 rivet set in a bar so you can reach in to close spaces. 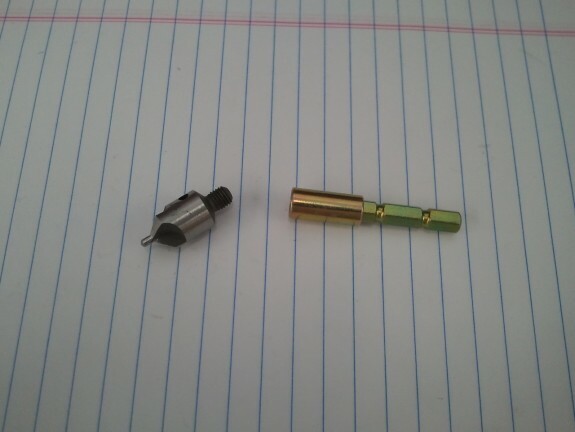 You then take a rivet set with a hole in the end that will accept the male die and grab the rivet gun. Then you line up the pilot of the male with the hole and the female die. A few taps from the rivet gun and you should have a nice dimple in a tight spot. Sounds easy enough right? Remember when I posted about my shop air supply setup? Well, it turns out that my brilliant setup bit me. Part of the setup to use the tool above is setting the pressure right on the regulator for the rivet gun. The various pneumatic tools I have all use different PSI settings. I ran over to the regulator, excited to try my new tool, and dialed down the pressure to about 30 psi. I ran back over to the bench, lined up the pilot, hole, and die. I took a deep breath and squeezed the trigger. Almost immediately I thought…”Man, this thing is hitting really hard!” At that point it was too late. I had ruined the flange of the rib. It hit sooo hard, it cracked the rib near the radius bend. I immediately slapped the forehead and reprimanded myself for again not testing a tool on scrap first. Well…that part was scrap now anyways…so let’s at least get it right for the future. 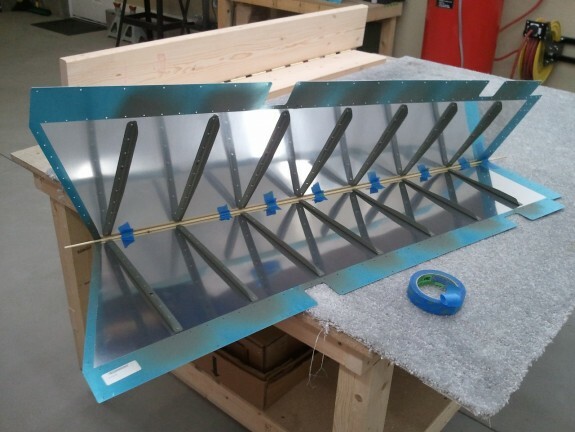 I could have just made a doubler out of scrap and perhaps made a scab flange and salvaged the rib, but empennage parts are cheap and I needed to place an order for some stuff with Vans anyway. So I went back over to the regulator and dialed it way down and tried it again on the next hole. Funny thing…it hit just as hard again. I was starting to thing something was wrong with the regulator or my rivet gun. I tried turning down the flow at the gun and hit the third hole. Some improvement, but still hard hitting. Tried another setting change and still…this gun is hitting really hard. The regulator was way down on PSI, the flow was down…what is going on? I grabbed some scrap and drilled and deburred some #40 holes and kept trying with no luck. In frustration, I looked again over to the wall and then realized my error. My hose was still plugged into the Tank Pressure Outlet. I was running 135 PSI through the gun. In all the time I was setting the regulator, I never noticed that I was plugged into the unregulated side of my setup. Immediately, I began to wonder…did I just ruin my rivet gun? 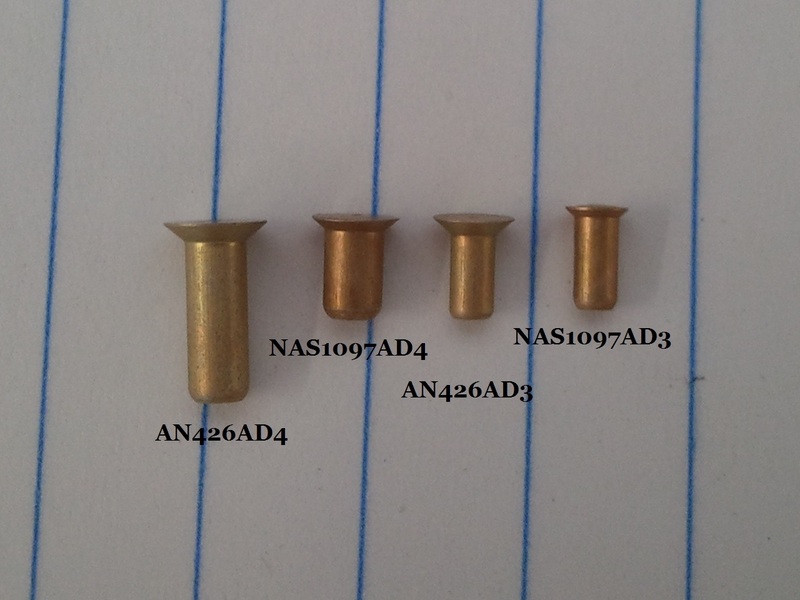 Did I bend up some dies…what else? Once I moved my hose over to the correct outlet, dialed up the regulator and flow, the remaining tests proved to work. The tool works great…if you are set up right. Doh! So…I needed to order up a new E-709. That killed my chances of getting the right elevator complete over the weekend. I decided to try my skill of stop drilling the cracks to make the most of the mistake. It turned out good. I still had things I could do over the weekend, so I set everything aside and called it good for the night. NEVER TEST A NEW TOOL ON AN ACTUAL PART!!! Make the brake out of 2×8 premium lumber. One half is exactly 60″ and the other was 54″. This gave side handles to the brake itself. Use as many hinges as practical. 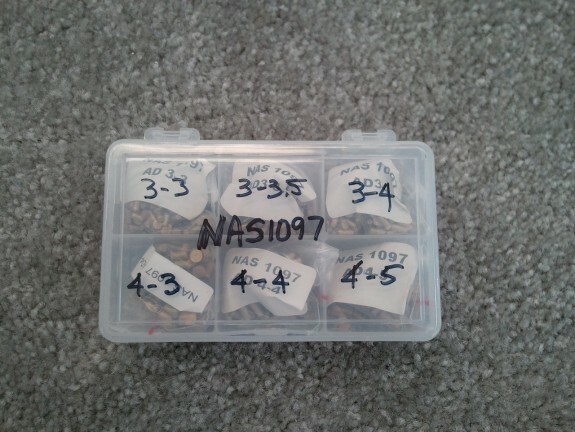 The number ended up at 12 – 3″ hinges. No gap in the boards at the hinge line. I did however bevel the corners a hair to give the hinge barrel some area to clear. 3/16″ Dowel in the trailing edge while squeezing to hold the radius (3/32″) in place while smashing the skins. For family night, we piled into the mini van (friend calls his a “Swagger Wagon”) and went out for dinner. We then hit Lowes Aviation Supply for parts. We took in some of the Christmas Decor that was out for sale already. I know…nuts isn’t it? 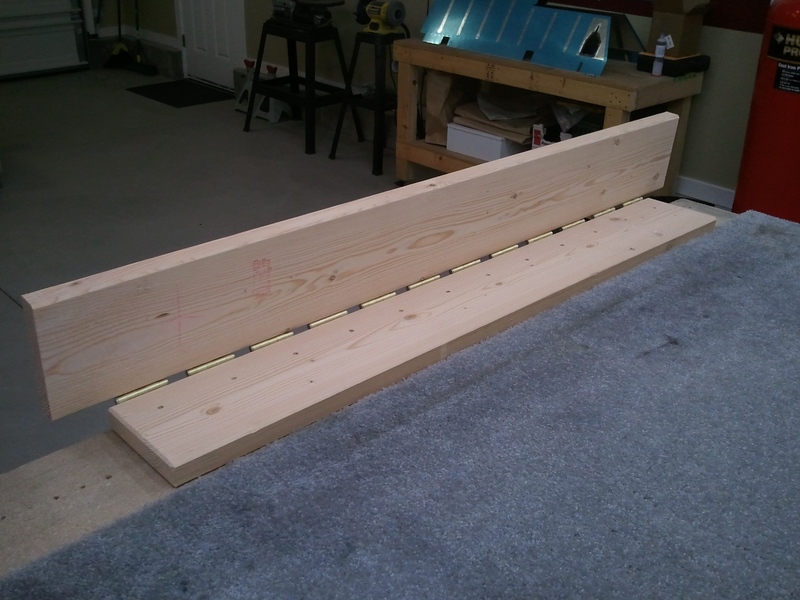 I picked up the nicest 2″ x 10″x 10′ plank I could find, a 3/16″ dowel, a 1/8″ dowel (just in case), and the hinges. A couple of other incidentals while we were there and back to the house we went. I then headed over to a neighbor’s house because he has some nice saws for woodworking. I cut the plank to length and dressed up the edges a bit. Here is what I ended up with. I center drilled all the holes for the 12 hinges (72) and then mounted the hinges with the screws provided with the hinges. Interestingly enough, each hinge also came with a 3″ screw in addition to the six standard sized ones. Rather than waste them, I chose to countersink the face of the break and drill and screw the brake to my build table. So at each hinge, there was a 3″ screw holding it down. Needless to say, it does not move. 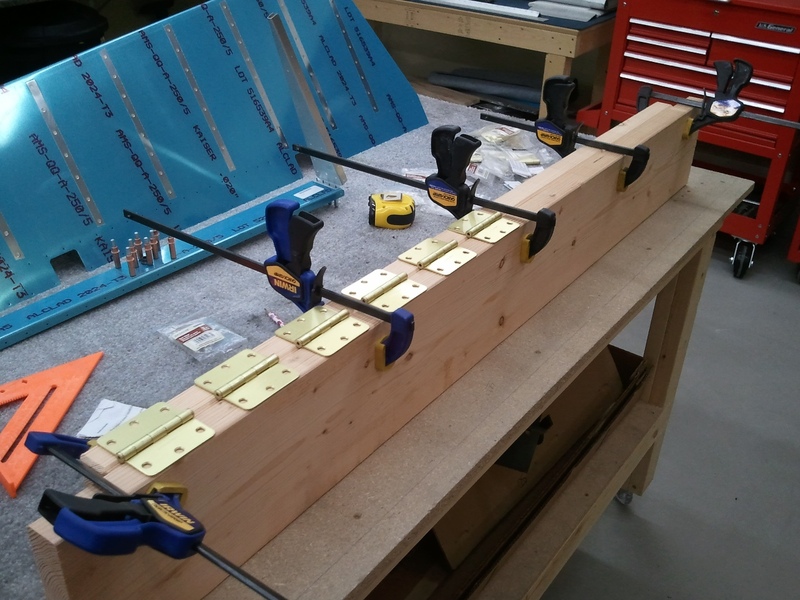 With 12 hinges, it takes a little pressure to actuate the break. Translation…no slop. Once attached to the bench, I sanded the interior faces using my orbital palm sander to insure no bumps or potential dent makers. OK…we are ready to destroy parts now. After some deep slow breaths…it was time to get smashing. Here you see the dowel taped into the trailing edge. The theory is that it backs up the bend to keep the radius intact while you are squeezing the skin together. The logic was sound so I incorporated it. OK…moment of truth. Time to slide the skin into the brake and push. Once the skin was in the brake and the trailing edge was against the barrels of the hinges, I flipped the top over and taped the skin edges down to the lower part with “Gorilla Tape” and started to push. I noticed that my pushing was not doing much. 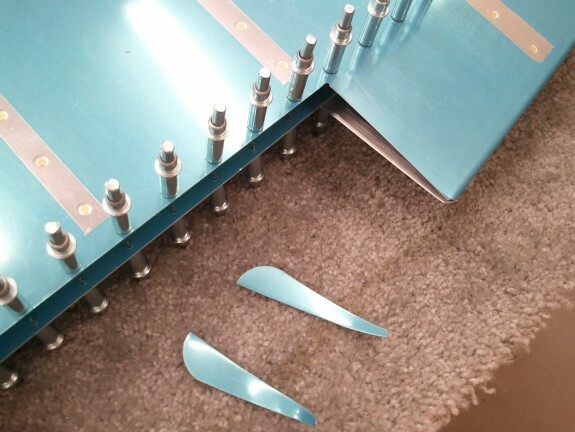 I stepped back and realized that I needed to back the trailing edge away from the hinges a tad. Perhaps this is the theory behind the gap in the boards. Once I backed it out about 1/2″, I could see that the bending was starting to occur. I then moved it out 1″ from the hinges and pushed. Again, it bent a little more. It was getting close at this point. I decided to flip the skin over and back it off another 1/2″ and really push. It took me standing on a stool and kneeling on the brake to really get all the force I needed to close the skin together. I was a bit surprised actually. I periodically checked the trailing edge and when finished, was pleased to see a straight and nice radius at the bend. I did have to take the dowel out for the last application of weight to get it a little more closed up, but all in all, it worked and was not that bad. I repeated the same procedure on the left skin. 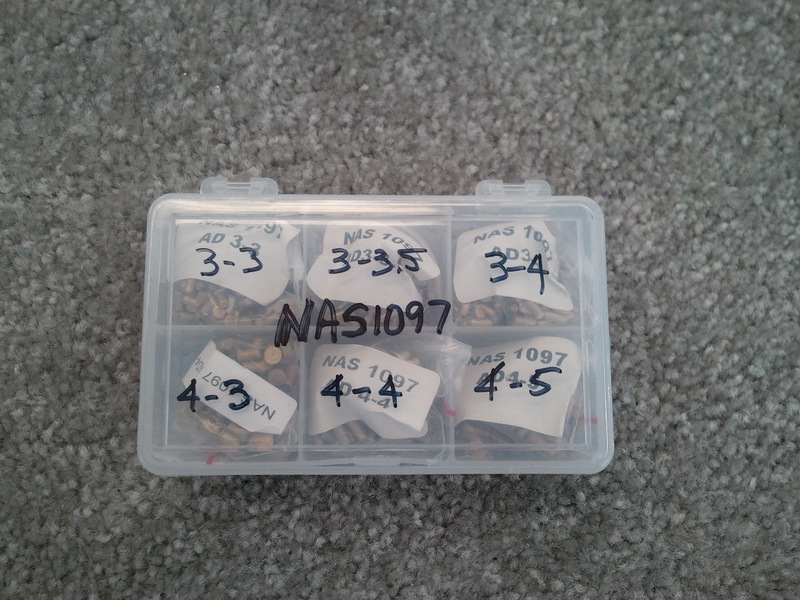 I may need a tiny bit of massaging to get absolute perfection, but as they are now…they will do just fine. I will evaluate down the road if the massage is really needed. These turned out pretty dang nice. I inserted the spar in the left skin and the root rib to give the skin some rigidity and then placed it on a shelf. 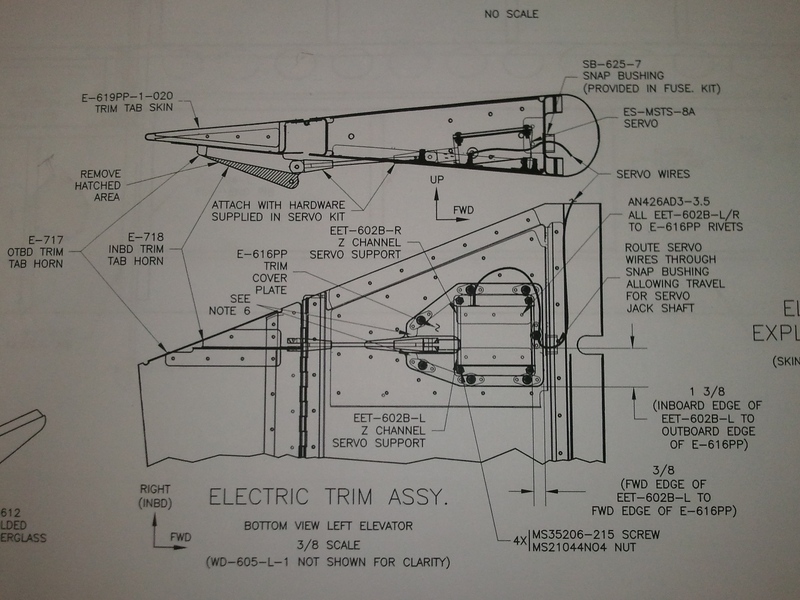 The manual has you work the right elevator first because it is a bit simpler since the trim tab is in the left. So I brought in the skeleton I had done some work on prior to bending the skins. It slipped right in and lined up like a dream. I clecod the skin to the under structure and then match drilled the control horn. At this point I simply need to match drill the skin, deburr, dimple, prime, and assemble. OK…not true…but close. Rather than chance a mistake, I closed up shop for the night. Not too many pictures today. I took care of a few “Honey-Do’s” and then headed to the shop. With all the parts primed and ready to back rivet the stiffeners on, I went to it. I like back riveting, it goes fast. Set the gun up, tape in the rivets, stack the parts, and smash them together. I knocked out the stiffeners and trim access doubler pretty quick. The next thing in the manual is to bend the skins shut to then attach them to the skeletons. I am very nervous about that step and have yet to build my bending brake so I was near to a standstill. I decided to start on the Right Elevator Skeleton as far as I could before needing the skin post smash. I was able to fit the counterbalance weight in the skin and begin the skeleton assembly. I drilled the counterbalance weight and match drilled all the plate nuts for the hinge points and prepped the ribs in the counterbalance. At the end of the day, I had a skeleton that was match drilled as much as I could before needing the skin. I guess it is time to study up and get the brake made and make the “bend!” I’ll read up on it tomorrow and maybe tackle it on Monday after family night.